Today, we got a first look at Charlie Cox from the set of Netflix/Marvel’s Daredevil project. 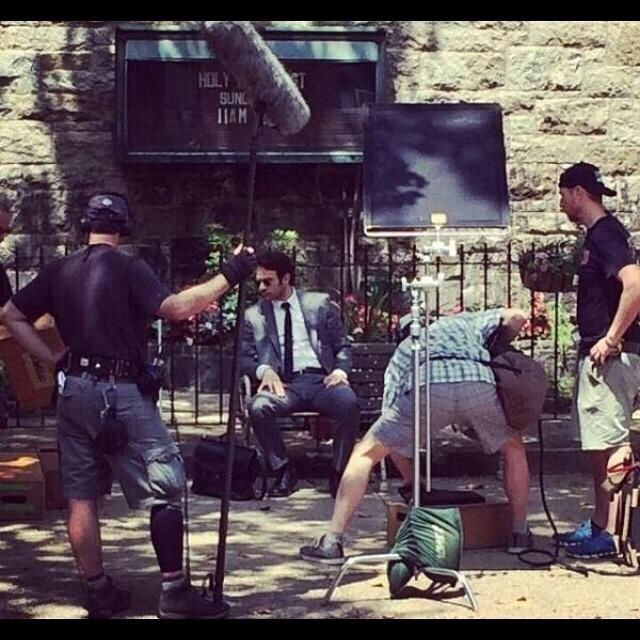 We see Matt Murdock sitting outside of a church in Brooklyn. Marvel has specialized in making movies of a certain genre from fantasy (Thor), to spy thriller (Captain America: The Winter Soldier), to techno-thriller (Iron Man 3), and now to space opera (Guardians of the Galaxy). However, Marvel has been a bit more homogenous in its TV efforts with Marvel’s Agent of S.H.I.E.L.D. which is a suped up procedural. We will have to see how they handle Agent Carter, which for my money, I would turn into Mickey Spillane–a film noir potboiler. I believe that Daredevil (and the rest of the Defenders series) will take a page from what Drew Pearce established with All Hail the King. Pearce cribbed his aesthetic from ’70s grindhouse, and Daredevil executive producer Steven DeKnight has acknowledged that they would be doing the same with a “gritty” look. I don’t know if he’ll get any credit, but Joe Carnahan was once attached to a feature film Daredevil project and even released his version of the sizzle reel when development fell apart. Daredevil would appear to have a wonderful look, but let’s see where the story goes and how it connects with the other individual series, as well as the larger Marvel Cinematic Universe. I wonder whether they will go the route of a Rockford Files or Baretta kind of private eye show (because that’s the way I would go). No release date has been given for the Netflix series, but expect to see more photos of Cox’s fellow castmembers, Elden Hensen (Foggy Nelson), Deborah Woll (Karen Page), and Vincent D’Onofrio (Kingpin) coming soon as filming picks up. Simon Kinberg sat down with Latino-Review for a long conversation with Fox’s Marvelverse and his contribution to the development of these films. Kinberg talked about the relationship he now has with Fox as he has been placed in a guiding role for both X-Men and Fantastic Four franchises. Kinberg also went on to talk at length about what we could expect from Fantastic Four with Josh Trank at the helm. However, he confirmed that they would not be presenting any details of the production, like cast concept photos or pre-visualization. The talk then moved on to the X-Men franchise which was successfully rebooted by X-Men: Days of Future Past. Kinberg worked closely with director Bryan Singer to bring the huge casts of First Class and the original films together in one film, and effectively cull the new franchise of all the past film indiscretions. Kinberg was also asked about just how the Four Horsemen would come to be in the next X-Men sequel. Latino-Review asked how much longer we would see Hugh Jackman’s Wolverine in the franchise.